Dark Explorers TCG Cards Sales + Leftovers! First off all orders have been shipped and should either have (hopefully) arrived and or be arriving soonish! I updated PayPal about the confirmation of your order if you didn't get one, please let me know! Also, I am HORRIBLE at remembering who I owe feedback to. So if you would like or I owe you feedback, just leave me the link and I will leave you some! That's it for now folks! Until next time where I will have a collection update hopefully some time soon! EDIT: Does anyone know the average price for a Flareon canvas plush nowadays??? I am now a fire type collector. I have always been a wannabe, but too scared because of the thought of how much money it'd cost. I decided it will be a VERY slow process, but it will indeed happen, no matter how gradual. I've always loved fire types. No type is better in my mind. Maybe it's because of my intense love for Arcanine, but who knows? I WILL OWN THEM ALL... someday. Let me know if you guys have any of these plush for sale! I seriously cannot wait to start this collection! hey everyone! I don't post as much because I am trying not to spend too much money (going to an anime convention and then having a wedding a week later and it's so costly @_@) but I wanted to post and say hey! pluuuus, I found this random marill item just now! The description says something like "petit forks." 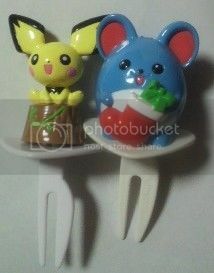 The marill is so cute, and it comes with so many Pichus!!! I was thinking about bidding on it but I have no use for any Pichus, especially not 4!!! I was just wondering if anyone would be interested in a random Pichu? It has a really cheap starting bid. They'd be like... roughly 2.50 each or something. They are so cute @w@ let me know if you'd be interested in a GB! it is time, for another magical friend time, of My Pokemon Collection additions. this month...technically, last month, thanks golden week delays, we have these six in the lineup! join us in a few weeks for set 15... including the first MPC i will add to my collection in five months!!! D: D: D: that's too long! make more MPC! Hello all! Sorry for posting so close to my previous post, but I really needed to get this off my chest. I have a want, and it's huge. I mean, I don't know if I could forgive myself if I never got this. I've had dreams about owning it! 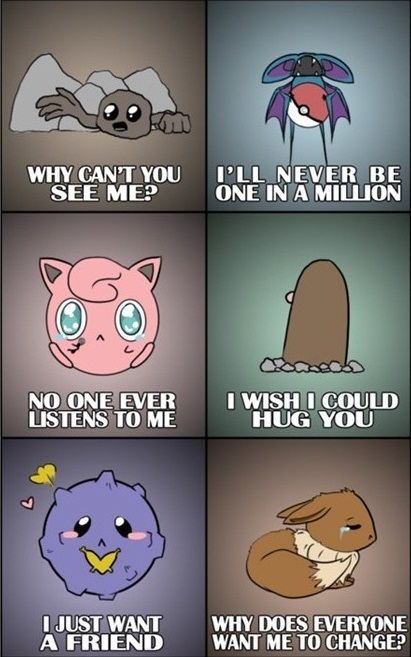 The 1/1 Eevee. I know, its rare, and she laughs at me because she knows I want her. I can pay 300 USD for a spanking new one. But! I accept damaged ones. I don't even care HOW damaged, I can repair it somehow. Be it a missing eye, rips galore, in need of patchwork, anything goes! I'll just deduct the amount paid to 150 USD or less, I can afford either. I'm getting a paypal set up in the next 3-4 weeks and I have TONS of money to spend from years of saving, but only this Eevee will do! Sorry for sounding annoying if I did, and I won't post anything else for a long while now that this is taken care of. 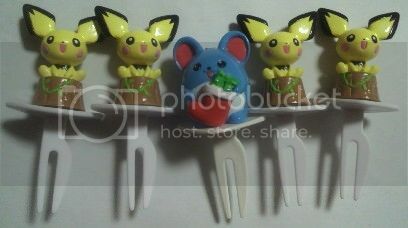 ^^ If anyone has any lead, or if you can't stand looking at your demolished 1/1 Eevee, please let me know. ^^ Thanks! On their way to me! Hey again everyone! guess what I will get mailed soon to me? A cutie Banpresto Arcanine! got it for 15 euros might be here within a week YAY! I was just at Walmart today and they already had the Dark Explorers booster packs out ($4.18 each) , along with the two promo packs ($4.98 each)! My Walmart rarely has things ahead of time, so I assume others must be in the same boat! I was also there the other day and they had a number of the "Let's Find Pokemon" series books in the bargain bin for less than $4. Definitely worth looking if you're a fan of those! Yes, I am somewhat of a Mew collector, but I would rather have the 1:1 Mew someday instead of this one, since I am not out to collect all the Mew things! If it is anywhere as rare as a Mewtwo bath buddy, I can imagine that the price I start it at is I good one. But, then again, I kind of fail at pricing things...so...here goes! Oh, and, I'm going to reauction my Kyogre pokepark plush, too, but I will starting it off at a better price. Long time no post~! I just came back from Hong Kong and have many things added to my collection now. But that is not the purpose of this post. 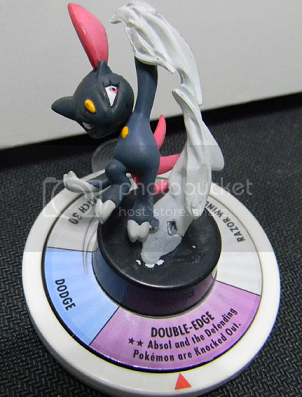 I have just found this Sneasel TFG online. Did anyone else know this existed because I didn't. Is this rare? 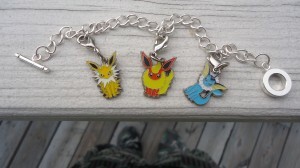 Jolteon Poke doll want, and a question about charms? 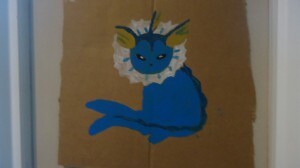 I won't even bother showing my Jolteon and Flareon paintings XD. That's it for now, and again, if anyone has a Jolteon Poke Doll for sale, I would love to buy him, thanks! So, this past weekend, I went to Kings Island Amusement Park over in Mason, Ohio. The day I went was opening weekend, so I figured that they wouldn't be out of many prizes yet. Thus, I went in hoping that I could find at least one Pokémon plush. I'm finally able to take on some custom amigurumi orders! Before you comment please read the rules... ALL of them. And yes, I do have purple hair right now! As my eeveelution collection grows (which I will make a collection post when all of the items I am currently waiting for gets here), there are just more and more stuff I need XD. First off everyone who purchased or commissioned me - everything was shipped off today :) I'll be sending reminder comments tomorrow in case anyone misses this post. Also the postcards finally came! ): apparently they got sent all the way to LA which delayed them to coming back up here. Also Hideyoshi + Infernape is available! 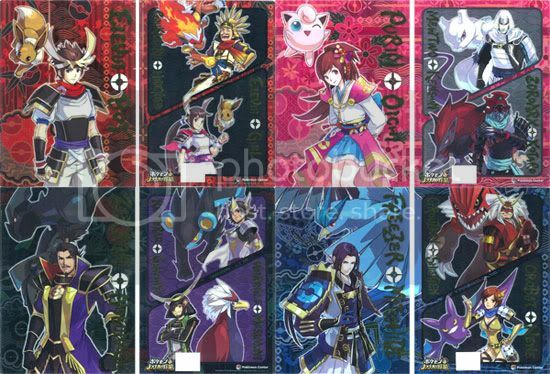 Also is anyone perhaps interested in group buying these clearfiles (I can order multiples of each kind)? (four different kinds) the backsides are what are probably most interesting to most people xD at least they got me. 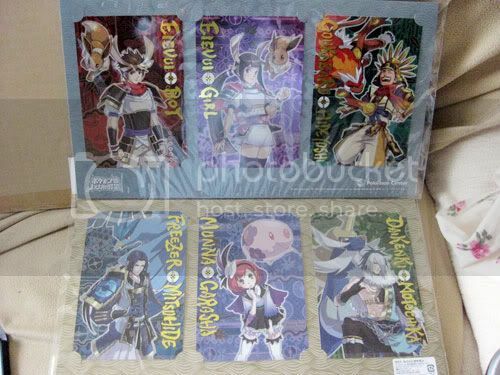 I could probably order them as well as some more postcards/other Nobunaga items if enough people are interested. Pwease, pwease, pwease have some fire pokes fo' meeee. Also, if anyone has any tomy, kid or zukan figures of the Pokemon that are in this list and want to sell them, let me know! Thanks guys! And also a QUESTION for everyone... if you decided to collect one type of Pokemon, what would it be?